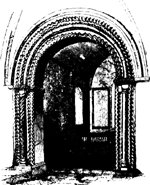 An arch which, in many churches, marks the separation of the chancel or sanctuary from the nave or body of the church. It is one of the first churches in England to feature architectural sculpture, in the form of the superimposed apostles on the chancel arch, the inspiration for which came from Romanesque churches in western France and Spain. Its records go back no further than the end of the 16th century, and there is no mention of when the church was built, but its frescoes on the chancel arch and apse are precisely dated to 1511. The Vicar of Driffield, the Rev Richard Carlill, said the stonework above the chancel arch was newer than the rest. The rood affixed to the wall above the chancel arch was installed in 1927, the figures in paper mache and the cross in wood. All Saints Church, nestled on top of the Burton Dassett Hills in south Warwickshire, dates from the early 13th century and still retains parts of seven medieval paintings, the most significant of which are on the chancel arch wall and appear to show part of a Passion cycle. The chancel arch window, which collapsed in the 1950s, has now been reinstated, making it visible for the first time in some 60 years. The church has its origins back in the 12th century and still has its original chancel arch. St Michael's Church still has the tower, chancel arch and south walls from the original Norman building and other interesting features include a fine carved oak pulpit, effigies (under the tower) and a font. The chancel, chancel arch and north transept date from the 13th century, while the south aisle arcade and great east window were built in the 14th century. And in a sense of misplaced triumph he painted his coat of arms high on the chancel arch of the church and erected a beacon on the highest point of the hills. The tower is the oldest structure in the area and also features a medieval font, a holy water stoup and an "apparently Norman" chancel arch.